“To me, that’s his legacy,” said MacLauchlin. Gossweiler passed away on April 10 after 45 years of teaching in the Virginia Community College system, most of them at Germanna. He had retired from teaching full time, but couldn’t stay away from GCC , its students and faculty and continued to teach part time. He was at GCC’s Locust Grove Campus that day when he began to feel ill and went outside to rest on a bench. He collapsed moments later. Germanna nursing professors who had come to love Gossweiler worked heroically to keep him alive till an ambulance arrived. He passed away that evening, with family --and Germanna faculty and staff who considered him family-- at his side. He was 74. 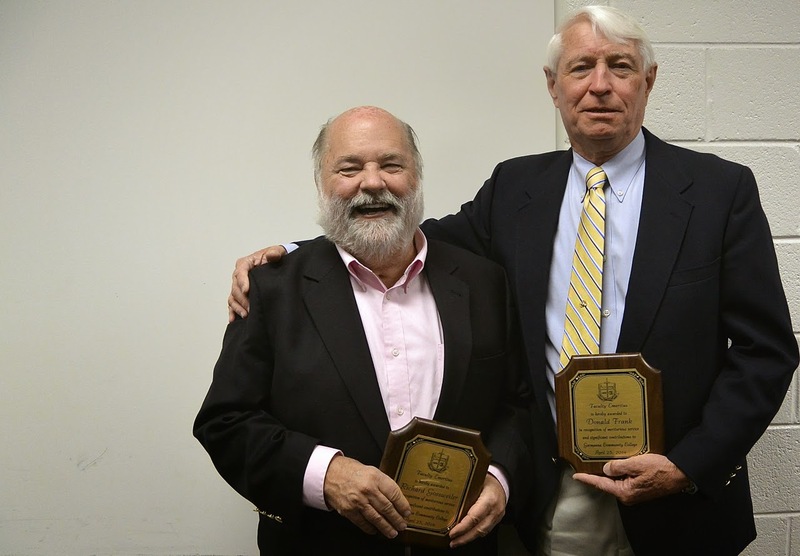 “Rich Gossweiler was not only a great teacher of students, but someone who played a critical role in mentoring faculty and staff,” Germanna President David A. Sam said at a celebration of his life at GCC’s Daniel Technology Center in Culpeper on May 6. Gossweiler also asked them to remember that “students are your friends." 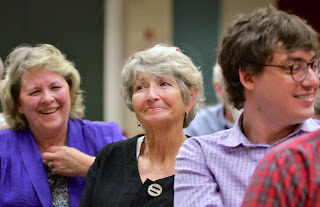 “When we go through town, we always run into our students. The wonderful thing about community colleges is you see the results—you see [former] students. You make friends,” he said. Many are passionate about teaching. Gossweiler’s feelings went beyond that. He couldn’t contain the joy the profession brought him--and it was infectious. “When he wasn’t smiling, he was roaring with laughter,” Sam said. “He helped instill in me the passion I have today,” said Dr. Patti Lisk, dean of nursing at Germanna. In a sense, we were all Rich Gossweiler’s students. He left so many of us with lumps in our throats. Recognizing and Celebrating Student Successes ceremony.Wednesday night. Great Expectations prepares foster care youth aging out of the system for the transition to college in part through mentoring. 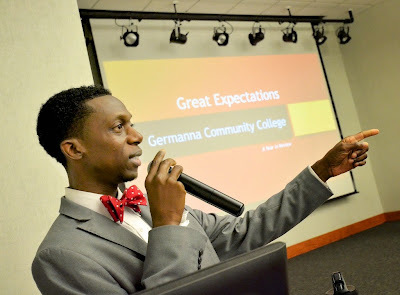 Antwan Perry addresses Germanna Great Expectations students. 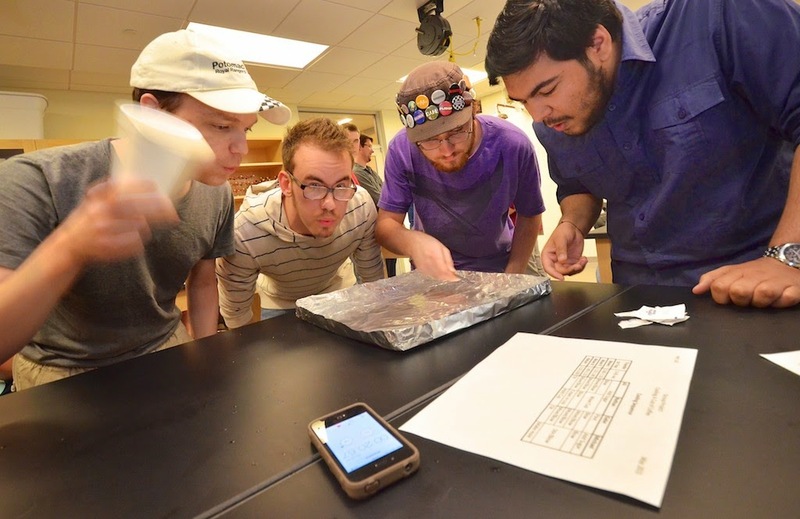 Prof. Mirela Fetea’s Physics 242 class was working on a “How to Cool Down Coffee, Tea or Hot Chocolate” project Tuesday at Germanna Community College’s Fredericksburg Area Campus in Spotsylvania. Quickly pouring the creamer and sugar in, or pouring them in right before you drink, stirring or shaking the cup, blowing on it. "By moving the tray around they tried to maximize the loss of heat via conduction - transfer of energy by the movement of particles that are in direct contact with each other. The larger the temperature difference between the objects, the quicker the heat transfer is. As soon as the temperature of the table surface increased, they moved the tray to another spot, having a slightly lower temperature--room temperature--and therefore speeding up the heat transfer." First place: Nathan Helmly, Ethan Martin, Joseph Medawar, and Vincent Eastman. Sexond place tie: A team of Ali Hayder, Gabriel Simmons, Michael Hales, and Nathan Richters and a team consisting of Daniel Carder, Kristy D'Alessandro, Donnie Lewis, and Justin Wray. to cool down a hot liquid during a Germanna Community College physics class. and principles studied in their University Physics II class.